The viewfinder may not flip out to the side completely. It might just make its first move out in that direction, to better clear the eyepiece. Swing the right edge out a bit, then the left, now it's out and clear of the eypiece and can tilt up. Hope so. Not that I will be able to afford to upgrade my E1 until it's successor has been out for a year or two. Nethertheless, I'd prefer a liveview that moves similar to the E330. If the photo is accurate, it looks entirely hinged on the left side. They DCWatch site said the same thing about the model displayed in Tokyo, but since it's still only a final design model, nobody can be sure, I guess. Seems to me that if you were on the "jumping" fence, or were talked off of it for the time being by people like me, I'd climb back on and leap. From last years clay-mation model, to this now? What is one thing todays camera buyers care about (not that it is important, but...)? How many pixels? Is it 10mp? We don't know. Might be, might not. When is it coming? Sorry, a "range" like 2007 or "summer" isn't good enough, but thanks anyway. Can they not at least say "August" or something? And the big laugher in the whole thing for me, it does NOT have a dang name yet? You kidding me? Canon sure is a bright example of marketing compared to these folks Olympus has. Canon doesn't have a new Mk III on any stores shelves yet, but they have PLENTY of discussion on its features, and if you want any info about it (Official press releases, complete specs, white papers, etc.) you can get them. Us? We get basically nothing. Seems to me this new camera hasn't even seen the light of day yet, and exists only in the mind of a guy with a while jacket in some clean room somewhere, who apparently doesn't know what "name" sticker to put on the front of the thing he doesn't have. I am sorry to all that I talked out of jumping. Feel free to continue your efforts. P.s. How do you think you change the shooting mode (PASM) on this camera? I'm sure the MF/S-AF/C-AF 'switch' will now be a button on the top panel (we don't have a top view yet). That means a press of a button and a turn of the dial. If so, this is excellent news. That pesky little button on the E1 is one of its few design faults. It's always getting changed accidentally as I take my camera in and out of its bag. I don't think the LCD will need a protective cover. The way these side hinged LCDs usually work is that when you fold it out to the left you can then rotate through 360 degrees (otherwise you won't be able to see it from the rear of the camera). This means that you can store it away so that the LCD screen faces in towards the camera when not in use. We ought to start a pool to guess the MSRP of the new E-whatever pro body. I'll guess $2399 USD. I agree Doug that this looks like a pop-up flash. If it's not why would they compromise the smooth design of the hump with just a fancy separation groove all around the perimeter? On the other hand it makes zero sense to put pop-up flash on a the only pro camera in the line up. Maybe they will shock everybody with another pro camera? p.s. I must say they all look like nice and very functional cameras. There is no built-in flash. it doesn't bother me, if the popup flash will not decrease the water and dust resistance. I don't think there's any doubt that there's a pop-up flash... The button to pop it up is right below it to the left. And again Ray is right: those are two screw caps. What is that green-blue label at the back of the prism, left side? Looks like it reads "Copy" and there is a printer symbol below it. I assume it's some pictbridge thing? The current cameras have something similar although I've never used it. I had the same thought, plus it has a popup flash despite being weather sealed which again was a no-no for a pro weather sealed camera apparently. What year for the E-pro? This can be read as meaning that a working version or prototype of the camera will be shown this year (the "debut"), but that it won't actually hit the shelves this year. Otherwise, why not just come right out and say that the camera will "be available" this year (the E-510 press release says "The Olympus EVOLT E-510 Digital SLR will be available in June 2007.")? 1. 3-5 cross type auto focus senors and several linear ones in a wide area array. 2. Good to great image stabilization at 200mm such that we can shoot at 1/60th or better with no camera shake. 3. A nice big buffer and a fast frame rate - 5-8 fps would be perfect. I know this doesn't appeal to everyone but if your going to sell to a broad cross section of pros you'll need to have this. 4. Anywhere between 10-12 megapixels and low noise at 800 that at least keeps up with the Nikon D2x, D200. That's it! If they can add that as well as include all of the amazing innovations I've seen on the press release and in the E510 they'll have a system that any pro should put on thier short list. I have it on good authority (my personal tea leaves ) that it'll be 12. I can't see them camping out on the same plateau as the E-410 and -510, and I'll also hazard a guess that the jump to 12MP for a pro camera is what's been holding them up these many months. 12 clean MP on the 4/3 sensor is a far higher hurdle to clear than they initially assumed, or so my tea leaves speak. The technology just hasn't been there to date. From there on out, the leaves look pretty muddy . . . I have to admit, looking at that camera, it just doesn't give me the vibes of being a full blown pro body like the E1. The pop-up flash, articulated screen and the way the grip fits, and the back looks like your thumb would lay over some of the controls. I really liked the look of the earlier iteration, this one doesn't give me much of a warm feeling. The camera looks like two degrees away from production, not even the preproduction model. It does not have the flow of the batterygrip to body like the E-1. It looks like the rear screen could be boosted to 3 inches in size if there was no need to remind people who the manufacturer is. 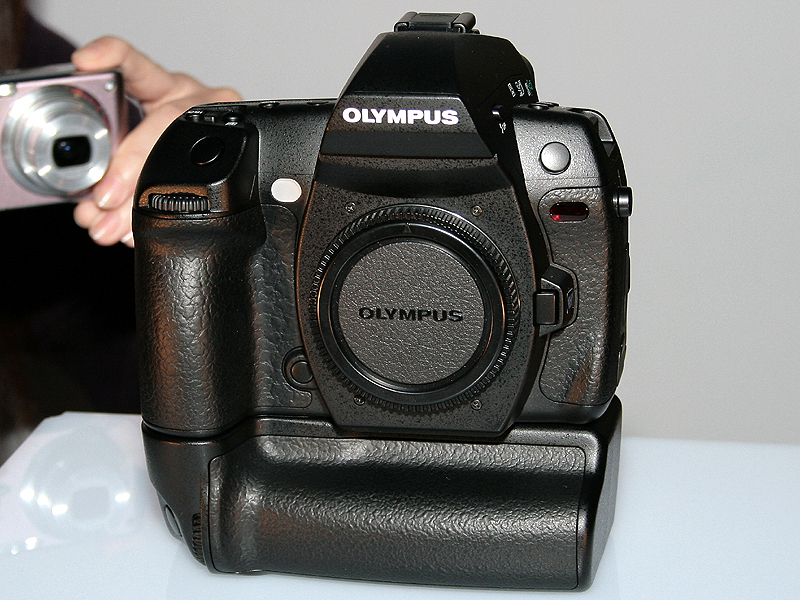 To me Olympus must have had a few designs in the offing and then they waited until after Canon released their "big gun" before showing their hand. The good rumors speaks of 11 focusing sensors (give me 5 cross type that are selectable) but the three sensor button remains. It appears also that Oly is holding back a wireless flash system until the date the preproduction body surfaces for real. ........and maybe this is all a figment of my imagination. I'm with Craig on this one. I was holding out for something much much more robust and more "traditionally" designed for pro users. The pop up flash is absolutely worthless to me. The flip lcd is ok if its completely weather sealed, but it looks like it won't have a protective cover, a HUGE no no in my book. As mentioned before the battery grip design doesn't seem to be on par with the E-1. And to top it off, it appears to have a pictbridge button as John pointed out. I can't imagine any pro wanting to print directly from camera without running his/her images through some sort of post production application, especially those of us who shoot in raw 95% of the time. To me, all of this seems "semi-pro-ish". Let us hope this is a semi-pro body (Exx? ), and the previous mock up is the flagship. Perhaps they haven't named this model as to not let on it's in fact a semi-pro Exx. While a lot of this is pure speculation, it does appear that the model shown is near completion. If this is the Ex, it looks like I'm packing my bags and moving on. My apologies if this rains on anyone's parade. For some reason the "P-1" doesn't look like the professional camera everyone was expecting. 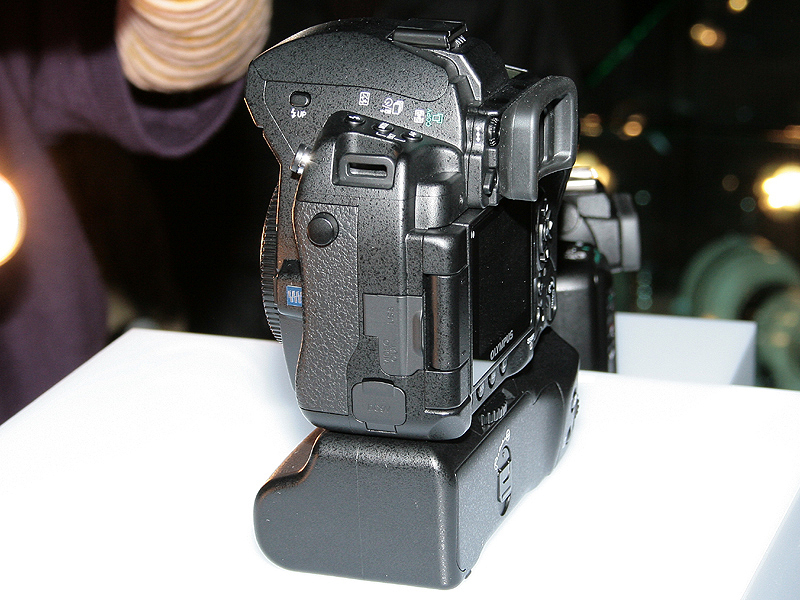 It looks more like a Nikon D200 semi-pro body. But Olympus keeps calling this the successor of their "flagship" professional body..
from the looks of it, the weatherproofing won't even be remotely similar to the ruggedness of the E1. A built-in flash won't do the sealing much good (ok, it'll be weathersealed, but the E1 can almost be submerged under water). I don't like how the grip looks, but I guess that's not final yet. I was actually hoping that the live view LCD option would be wireless, with a "clip off" LCD screen.. The worst thing I saw so far is the button for select focus point still the old 3-point one.